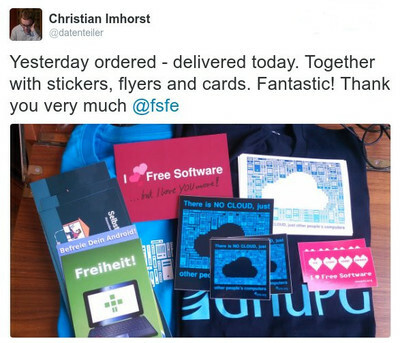 It has been a busy year for the FSFE. Upholding the principles of Free Software and protecting citizens' from being exploited are ongoing challenges we tackled from a variety of angles. We (and by "we", we mean the staff and volunteers at the FSFE) pored over hundreds of pages of policies and legislations, looking for loopholes through which Free Software could be attacked. We travelled to events all over Europe, often carrying with us dozens of heavy boxes of merchandising, to explain what Free Software is all about as speakers and attendees. We have organised our own events too including our first international summit. And we have dreamt up and executed campaigns to spread awareness of the threats to Free Software and users' freedoms. This has entailed mobilising dozens of staff members and volunteers, contacting the media, and designing and ordering T-shirts, squishy stress balls/hearts, and balloons, lots of balloons. What follows are just a few of the highlights from 2016. We have been carefully monitoring policies and legislation in Europe and intervened when citizens' rights were in peril. We have formulated several proposals to EU institutions and EU member states containing concrete steps to solve the issues with the EU Radio Directive. This Directive threatens software freedom with its ambiguous phrasing that all but forbids users from installing unapproved software (read "Free operating systems") on radio-enabled devices. These devices include all modern laptops, wireless routers and every single smartphone in existence. Over 40 European organisations and enterprises support our concerns and demands.Max Mehl and Polina Malaja will be doing follow-up on this with along with our volunteers and other organisations to make sure you can still install Free Software on those devices. Another threat to Free Software is the EC's stance on the Digital Single Market strategy. We have patiently explained several times why FRAND licensing, the licensing favoured by the Commission in its "ICT Standardisation Priorities for the Digital Single Market", is incompatible with Free Software and why a more liberal model should be used. This is still an ongoing battle. Staying with the EC, we tried to help out on the "Free and Open Source Security Audit" (FOSSA) project, commissioned jointly by the European Parliament. The project should have helped evaluate the suitability of the Free Software used in public administrations. A professional audit of Free Software tools and frameworks would seem a good thing at first glance, an excellent way to test run software and improve it when bugs and vulnerabilities pop up. At the very least it would help protect citizens' data stored on public servers. However, after reading the results, it was not clear the time and money invested into the study had been well-spent. The conclusions were sometimes vague and some parts directly wrong. Despite our best efforts, the company employed to do the survey did not seem to know much about Free Software at all. That said, the EC and MEPs in charge of the project, were always open to our comments and able to push for improvements, although they were bound to a contract with consultants who were not too knowledgeable about Free Software matters. Viewed as a pilot, it helped everybody see where the pitfalls were. With a bigger budget and the lessons learnt, the EU is planning to follow our advice and improve the project in future iterations. We even put the law to the test, and our colleague Max Mehl, the FSFE coordinator for Germany, sent out "alternative" routers to testers so they could try them with their Internet provider. We published the results on our Wiki to help others who are thinking of changing their devices. But not all our campaigns have been so serious. We have also carried out a campaign to raise awareness about Free Software amongst the general public, and here "light-hearted" is literally the keyword. We launched our 6th "I love FS" campaign on Valentine's day. During this campaign, we encouraged all our friends to make a display of love towards Free Software by telling the world, online with posts to social media, or offline, with public demonstrations of FS love. Online, we got tweets and blog posts from users, volunteers and sympathizers explaining what they loved most about their favourite Free Software project. Offline, we had at least one cake baked by the WikiMedia Foundation, gifs of people squeezing our #ilovefs stress heart, and pictures of people from all over Europe waving our "<3 Free Software" balloons. In a similar vein, we wanted to help the general media, local newspapers, radios and TV stations, to know more about Free Software. To this end we started our "Meet a Free Software Hero" campaign. Part of our larger 15th Anniversary celebration campaign, we encouraged volunteers and media outlets to get in touch with each other so that the "heroes" could explain what software freedom was all about, and bust a few myths at the same time. Thanks to the campaign, we managed to increase our profile with the media and it has now become much more usual for journalists to get in touch with us to comment on stories. This gives us more visibility and influence to affect changes in favour of Free Software. Another way of reaching a wider audience was through events. 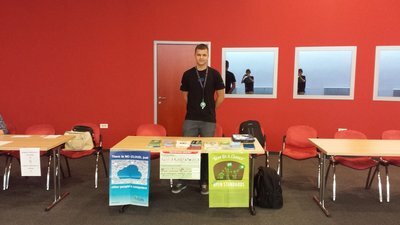 Apart from participating in Free Software-specific conferences like FOSDEM, LinuxCon and different Linuxtage (we took the FSFE booth to all of these), we also participated in the Wear Fair and more. This event is Austria's largest textile fair for sustainable clothing and lifestyle, and covers from organic food, to DIY electronic repairs. The themes of sustainability, individual personal freedom and alternative economic models helped our Foundation fit right in and we sold plenty of T-shirts, bags and baby vests. We also collected contact information of people interested in our cause. But we are prouder of the two big events we organised ourselves. In April we held our annual Legal and Licensing Workshop. This Workshop is set up by and for members of the FSFE's Legal Network. Legal experts from all sectors of the industry got together to discuss licenses, compliance and what constitutes derivative work for three days in balmy Barcelona. Speakers included Harald Welte of gpl-violations.org fame; Miriam Ballhausen from JBB; and Eben Moglen, chairman of the Software Freedom Law Center. Our Legal Coordinator Polina Malaja together with our trainee Olga Gkotsopoulou are already busy planning next year’s conference which we expect to be at least as successful as 2016's. Similarly exciting was our first ever FSFE Summit in September, in which, Erik Albers, our community builder, commandeered a veritable army of volunteers and interns to make sure that everything run smoothly as a part of QtCon and in collaboration with Qt, KDAB, VideoLAN and our associate organisation KDE. Part celebration of FSFE's 15th anniversary, and everything we have achieved over the years; part event to talk about the non-technical aspects of Free Software, we covered the topics of Free Software in business, the public sector and as a force for social advancement in more than 50 talks. We also had our 15th birthday party. Speakers included, among many others, the two prior presidents and the one current president of the FSFE, that is, Georg Greve, Karsten Gerloff, and Matthias Kirschner; Sonia Montegiove and Italo Vignoli, the architects behind the migration to LibreOffice of the Italian Armed Forces; and Roberto di Cosmo, co-founder along with Stefano "Zach" Zacchiroli of SoftwareHeritage.org. Julia Reda, MEP for the Pirate Party, closed the event with a keynote on copyright reform and made the case for Free Software on machines critical in modern democracies. She explained, for example, why using inauditable proprietary software on voting machines was unacceptable. Which brings us to the subject of how we used events to make the network of Free Software organisations stronger. The Software Heritage mentioned above, for example, collects programs, applications and snippets of code distributed under free license from several sources. It aims to preserve an encyclopedia of free code for posterity. It was clear from the start that the FSFE and SH had a lot in common, so we supported the initiative early on, helping them get coverage in the media and offering them a platform to spread the word about what they do. We also strengthened our ties with the Document Foundation by joining its Advisory Board. At the same time, The Document Foundation became an associated organisation of the FSFE. This means that we will be offering advice, support and suggestions on one of the most successful Free Software projects out there: LibreOffice and all its ecosystem. With the Document Foundation as an associated organisation, we created official channels for the exchange of ideas, coordinate efforts, motivate each other, and find opportunities to work together on specific projects. 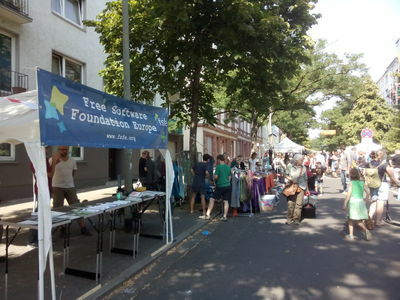 Another thing we did was to hand over the running of the FSFE's Document Freedom Day to Document Freedom Foundation. The DFD already organises the Software Freedom Day (SFD) campaign, the Education Freedom Day, and the Hardware Freedom Day. It seemed logical that they also organise the Document Freedom Day. Like that they widened the range of related events they offer, and it allows us to concentrate on core Free Software topics. But there is still a lot of work to do and 2017 is shaping up to be an interesting year. Although we have managed to get the ban on compulsory routers into law, we expect that ISPs will fight back, so we will have to be on guard for that. The threat of FRAND licensing and software patents is never far off and we will have to continue advising lawmakers on why these are dangerous for Free Software and the European software industry in general. Katharina Nucon, an experienced campaign coordinator, will be helping us with this campaign. Most of our efforts, however, will most likely be spent pushing for getting more public institutions to publish their software under a free license. We want public money to pay for public code, and only public code. Software used by public institutions is acquired, deployed and/or developed with taxpayers' money. Making it available under a Free license to all citizens is just the right thing to do. Furthermore, we hope we will raise awareness amongst politicians of the importance of using Free Software when they see its advantages. There are several important national and regional elections scheduled throughout Europe in 2017. Politicians are supposedly more receptive during campaigns, so we will do our best to make candidates and parties commit to Free Software and openness in their administrations. We need governments to commit to improving policies that favour Free Software across the board. It is not admissible any more that the administration pilfer taxpayers money on proprietary software. We need policies that help the European IT sector become much more competitive and sustainable. There is no better way to achieve this than incentivising the use and development of Free Software and Open Standards. Finally we need better policies to help promote Free Software amongst the general public. Every European citizen must be allowed to regain control over the technology they use once and for all. FSFE campaign team preparing to show why public money should mean public code. Free Software improves everybody's life and the world. It is clear that everybody have been handed the short end of the IT stick for too long. SMEs need a level playing ground to prosper and create employment. Private citizens and business owners must be allowed to own and control the devices they pay for. Governments must be at the service of the people, as must the software they pay for with people's taxes. Free Software, Free Hardware and Open Standards solve all of the above. All of these things should be self-evident, but apparently are not. That is why we at the FSFE do what we do. Throughout this report we have mentioned some of the people that work to turn these things into reality. However, and it may sound cliché, but it doesn't make it less true, without the continued support from you, the volunteer, the fellow, the occasional donor, and the moral supporter, none of our staff would be able to do anything. We rely heavily on you, your activities and your donations to stay independent and fight for your rights when they are threatened, regardless as to where the threat comes from. Please help us make next year's report is as long as this one, and do consider joining the FSFE.